Our latest Art Lab: Living our Values, delivered in Dawlish and Newport primary schools over the Autumn term will culminate in a special event at Raven Row Gallery on 24th January from 6pm – 8pm. This years Art Lab for the Opossum Federation took a slightly different format. It was condensed over a three week intensive block which gave both pupils and workshop leaders a clear period of time to focus on the theme of this years workshop, ‘Living our values’. Pupils used our latest set of Emotional Learning Cards as a base from which to explore not just the core British Values as identified by the Department for Education but a range of key life values that can help us live well with others. Year 4 pupils from 4 classes at Newport and Dawlish primary schools had the chance to learn and build an understanding of what values such as tolerance, democracy, individual liberty and belonging really means to them. The pupils then applied this thinking, creating artworks reflective of contemporary art practice. 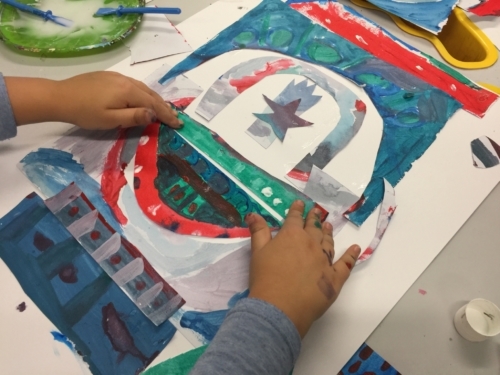 Working individually and in groups, they collaged together works full of symbolic meaning, the pupils were supported by family and art therapists from A Space to explore their ideas. 9 Art Leaders were then given the opportunity to build a deeper understanding of the theme alongside a wider knowledge of the techniques employed by lead artist Shiraz Bayjoo in his own work. The Stuart Hall Library also visited the school bringing a wealth of incredible artist books that filled the children’s imagination and fired their creativity. Resulting artworks will be on display for 1 evening only, alongside pieces by Shiraz Bayjoo commissioned to celebrate the workshops. We hope that you will join us to celebrate and to view the poignant and beautiful work by this years Art Lab pupils.